Nothing says “traditional” (or almost) as an oriental carpet. Traditional rooms are always visually busy and all too often clutter is the next stage. There is a constant combat, a look at me first, of the furniture and objects. This centrifugal effect needs to be reversed. Nothing unifies better than a room sized carpet. In a recent House Beautiful spread of a suburban Maryland dwelling, we find a living room perfectly integrated by a softly toned late 19th century Tabriz in a huge semi-repeating medallion design in hues of rust, navy, pistachio and beige. The carpet fills the room and effectively ties everything together. The room has plenty of contrasting pattern and scale, on the walls, with the tabletop objects, in the eclectic furniture and on the rug. But there is no clash, no conflict, no feeling of overloaded busyness. The carpet has neutralized the jostling for attention. Our rug U-1482, a 12.0 by 18.2 Meshad is a perfect substitute for the Tabriz with its expansive large allover pattern and semi-soft colors. We can expect a similar unifying effect in a traditional space with our allover palmette patterned carpet. 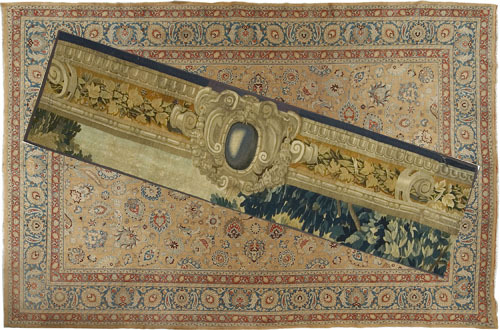 The 18th century tapestry fragment on the wall picks up the colors of the carpet. Our tapestry fragments, for example number CU-478, 1.10 by 7.7, c. 1700 , Brussels, are equally well suited to this stylistic mix. and room sized oriental carpets in allover patterns in decorative tones emphasizing blues and creams. For every room, we have a carpet that would work equally well to organize and render the environments welcoming and inviting. The eye is kept occupied with plenty of interesting objects integrated by the carpet. Our carpets are integrative, not dispersive.